Products from Rittal include industrial enclosures, power distribution devices, climate control solutions, and IT infrastructures. Rittal’s strength include its flexibility, modularity, availability, and simple design. HTE’s TECHTEAM will work to understand the goals and requirements of your applications, using this information to offer you the optimal solution for your system. Together with Rittal, HTE and will support you through each phase of the process, from the original concept through implementation using our massive local inventory. Rittal products are compatible for many applications across all industries. Ideal for tasks such as material handling, production, tool-making, and printing, their expansive selection of items is commonly used in transport technology, renewable energies, information technology, and food and process industries. Enclosures from Rittal come in all sizes for all applications, from small bus enclosures to IT enclosure systems and operating housings. Their power distribution line, ideal for low-voltage applications, includes busbar systems, mounting kits, and distribution racks. Their climate control solutions ensures heat loss is removed, with fan-and-tiler units to more advanced IT infrastructures. Their most recent developments include advanced heat exchangers and energy-saving cooling units. 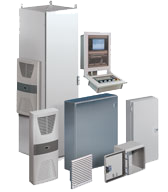 Rittal has the right enclosures and cabinets for the job regardless of the application. All products are offered with Rittal’s standard of quality, speed, and cost-effectiveness. HTE Automation is your Rittal distributor if you are located in Kansas, Missouri or Illinois.